NAIHS is a service oriented not for profit institution with functional college of Medicine, College of Nursing,College of Medical Polytechnic school, Post Graduate Medical education. and upcoming Dental College. NAIHS is committed to produce quality health professionals in respective disciplines not only for army but for the nation as a whole at an affordable cost. Nepalese Army has been providing free Medical treatment to retired army personnel, their dependents, and dependents of serving army personnel since1976 and this expenditure is also ever increasing. Nepalese Army also provides free medical care to civilians during mass casualty situation whether it is due to internal conflict, road traffic accidents, earthquake, flood or landslides in the country. NAIHS aims to support substantially in all humanitarian activities so that free medical service to these beneficiaries continues perennially in the years ahead. Therefore all the funds generated by NAIHS will be used in the sustainment, development, research and expansion of health services and medical education. The full execution of the making of NAIHS is divided in four distinct phases each of two years. The future endeavors being the College of Dentistry. NAIHS- College of Medicine (COM) offers MBBS program comprising of 4.5 years of study and a year of internship. NAIHS- College of Nursing (CON) runs PCL nursing, BN and B.Sc. (Nursing).NAIHS- College of Medical polytechnic(COMP) runs PCL in Medical Lab Technology,PCL in General Medicine, Diploma in Pharmacy, Diploma in Radiology, Diploma in Physiotherapy. Shree Birendra Hospital (SBH) at Chhauni which is a 635 bedded multidisciplinary modern referral Hospital of Army serves as the center of excellence to undertake all clinical teaching/learning activities for these programs. 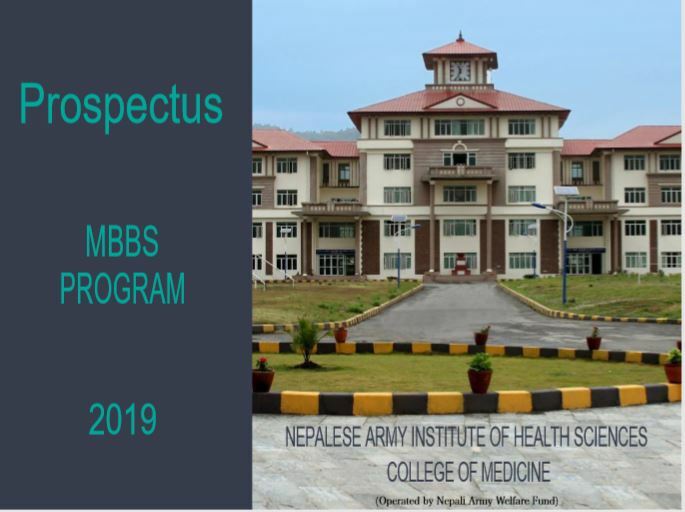 Nepalese Army Institute of Health Sciences (NAIHS) ,not for profit, service oriented, self reliant health institute of international standard is determined to provide international standard quality Medical education to students from inside and outside the country namely SAARC Countries and beyond. It has also been envisioned by Nepalese Army as a future center of excellence in the field of Medical Education in Nepal. NAIHS administrative block, the Basic science complex including Hostels and other amenities are located at Bhandarkhal, Sanobharyang at a distance of about 2.5 KM from SBH. NAIHS College of Nursing is also located in Bhandarkhal, Sanobharyang within the premises of NAIHS . 9. Noise proof 4 Lecture Halls( gallery type) to accommodate 150 students with good light, ventilation and state of art sound system,Tripple power point projections, interactive boards and other latest audio visual gadgets . 10. A fully equipped IT setup with 22 stations for students and faculties along with facility for scanning and printing. 12. Conference room in all the departments. 13. Modern Laboratories in all the departments. 14. Dissection Hall with latest design mortuary. 16. Attached and general Toilets ( male /female) in each departments.